RALEIGH, N.C. (AP) — The chancellor of North Carolina’s flagship university strongly indicated Friday that the school won’t return a torn-down Confederate statue to the main quad where it used to stand, but stopped short of confirming its former spot has been ruled out. 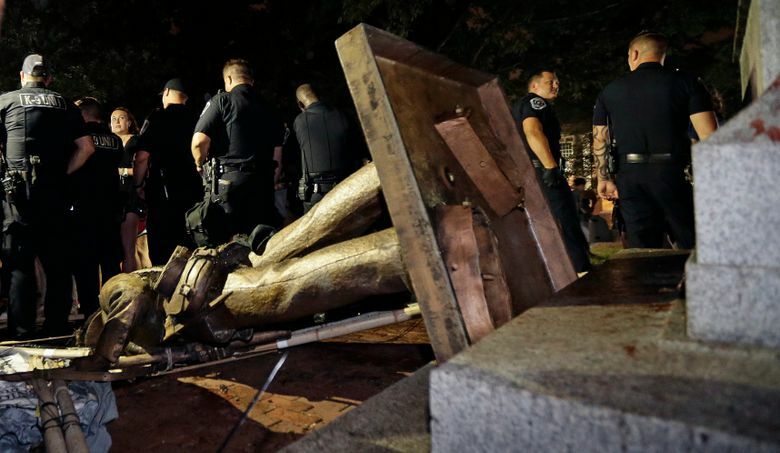 In a campus-wide statement , University of North Carolina-Chapel Hill Chancellor Carol Folt said that she was working with the school’s trustees on finding an “alternative location” for the statue that was torn down during a protest on Aug. 20. “Silent Sam has a place in our history and on our campus where its history can be taught, but not at the front door of a safe, welcoming, proudly public research university,” she said. Still, during a conference call with reporters Friday, Folt wouldn’t confirm the quad has been ruled out. “If you’re trying to get me to say where it’s going to be, I can’t say it,” she said. Folt said Friday that she and the Chapel Hill trustees will take recommendations in the coming weeks from students, faculty, alumni and others. Silent Sam had stood in McCorkle since 1913 until it was torn down during a gathering of several hundred demonstrators, who called it a racist symbol. Protesters used banners to conceal efforts to tie the rope they used to bring it down. Four protesters face misdemeanor charges of helping topple the statue. Tensions remain high more than a week after the bronze statue was taken down. About a dozen people have been arrested in follow-up demonstrations and counter-protests since the statue’s toppling, including three on Thursday night.